Random musings about sh*t, God and Supreme Stool Sample. You knew this was coming, right? Sure, it’s been a few years since I wrote one of these but in light of everything that has happened this year on my side of the proverbial wormhole of existence, I figured it was time to dust off an old tradition and make it new again. So? Here we go. New means not a retread of what I’ve written in the past. I can’t promise that this blog entry… This piece of Mental Flatulence won’t have echoes of past compositions in it, but I’m going to endeavor to freshen up the formula as much as I can. It all starts with the title. No “by way of” this time. Nope. Just the 2018 Edition tagline. And the question that proceeds it. What DOES this Thanksgiving mean to me? After all that has happened since I last wrote one of these, what could I possibly be thankful for? Well there are the obvious answers. A roof over my head, food in my belly, money in my pocket… You’ve heard the litany countless times. My family and friends? Of COURSE. I’m more thankful for them then I have been before. My minions especially. I’ve gotten accustomed to spending Thanksgiving Eve and Thanksgiving with them over the course of their lives. While others go out and drink, dance et cetera, I stay home, bake cornbread, watch “A Charlie Brown Thanksgiving” and the Parade (booyakasha, 6ABC. Respect) and chill with them before heading over the river and through the woods to Mom’s/Mom Mom Minnie’s for dinner. Our trip is always strategically timed to coincide with one of the airings of “Alice’s Restaurant” on WMMR (booyakasha, Pierre Robiere. MUCH respect). And after dinner? Homeward bound to wrap up the day and hit the sack. Maybe do some online, Black Friday shopping after midnight. That’s Thanksgiving in a nut shell for me. But this year? It’s a different… Feel. Sure, the tradition and schedule is roughly the same, but it’s just me and the girls this year for the first time in as long as I can remember. And because of that? I appreciate it and THEM even more. I mentioned in my last blog entry/piece of Mental Flatulence that I’ve learned to make the best of my reduced time with them and today of all days? That holds true. Heed my words, friends and somewhat constant readers: Treasure the moments you have with the ones you love because you never know where you, or they will end up down the line. Live for the NOW. Don’t dwell on the past. Embrace your present because it’s fleeting. It’ll be over before you know it. The same holds true for my family and friends this year. I’ve always been thankful for them. But this year? Moreso than before. No one man or woman is an island and there is NO WAY I would have survived this year, and the last couple of years without them. You all know who you are. You’ve been my constant… THE Constant for decades and without you I would have thrown in the towel/stopped fighting a long time ago. You were my Mickey and then? When Mickey left you were my Duke. “One more round, Frank.” Keep punching. You urged me to do so and I did. And here I am. A bit emotionally punch drunk but alive. Maybe not thriving just yet but there’s time. Sure, that whole line of thought was a completely gratuitous Rocky reference but sh*t: This is Philly. And Rocky is a part of my DNA. He’s a part of our birthright. Kind of like the Eagles and Cheese Whiz but easier on the stomach. That said, there’s more… A LOT more to cover in this new and hopefully improved What Thanksgiving Means To Me Edition but for now? It’s time to clean up and head out for dinner. I’m going to do something I rarely do. I’m going to pause writing for a tic. I’ll be back but in the interim? Home now with a full belly and an afternoon of football watching, online shopping and family time under my belt which is, I should add, stretched taught around my waist at present. No minions now: They’re with their mother leaving me alone in my single family twin in Swarthmore with only my thoughts as company. Don’t worry, everyone. I’m okay. Really. The silence that ensues 50 percent of the time these days is becoming a companion. Not feared, nor regretted but accepted. Kind of like an old friend that I can’t hug. Filling it can be a bit trying but so far, I’ve managed and will continue to manage because… Well? That’s life now. Better to accept it and not rail against it. I’m adaptable. I evolve. We all do. I’ve evolved a lot in my 43 plus years. And I’m sure I’ll evolve a lot more before the inevitable end, many, many moons from now. A few nights ago, a good friend and I had a long “talk” about life, the universe and everything on this side of the proverbial wormhole of existence. The word talk is in parentheses because I find myself not talking as much as I used to in the traditional sense of the word. Talk = Text in 2018. I probably spend more time texting now than I used to and for some, specifically certain people who shall remain nameless that have accused me in the past of being a “bad texter” (if you’re reading this, you know who you are and in a quick, parenthetical aside that virtually NO ONE reading this will get, dude? You were right. And I’m sorry) this is likely a relief. Welcome to the modern world, Frank. Mind the f*cking gap. But I digress. Our conversation was an enlightening one and in the grand scheme of my life, it was probably the one conversation that I needed to have at the perfect time. Consequentially, or INconsequentially depending on your stance, it was about ENDWORLD. Specifically the completed sequel and the as-of-yet, virtually unstarted, final book in the trilogy. I say “virtually” because I did begin writing it, I just haven’t gotten full on into it yet. It’s in the Literary Foreplay stage. A lot of kissing but little else. Anywhos, she brought a number of things to my attention and in doing so, answered a question that was almost the subject of another blog entry earlier this week. I mentioned, the last time I wrote that I had stories to tell. A little “magic to do,” so to speak (booyakasha, Pippin. Respect). One of them is, of course, HEAVEN AND ENDWORLD but there are others. Ideas that I have been considering for years and am eager to tackle. But what to write? Do I finish William’s story, or do I go in a different direction and leave William MacNuff and his not-so-merry band of revolutionaries by the roadside for a bit? It was quite frankly (no pun intended) a tough decision. Thankfully, Amy (yes, I’ll name you kiddo… You deserve it) helped me realize what I needed to do. I need to finish HIS story. William’s. The ENDWORLD Series. Because his story is my story, and has been for a good portion of my life. It, too, has evolved over time. The faces and the places have changed a bit but the ENDWORLD books remain, despite all the changes, an autobiographical fiction. My life as told through the eyes of a man, similar to me staring at a world that is LIKE mine but not mine. Another place on another side of the proverbial wormhole of existence. Some might think that a spoiler. Maybe it is and maybe it isn’t. All will become clear… Crystal clear soon enough but for now? There is only THAT. Because in order for me to move on, I need to finish his tale. And that, folks, is the ever-present crux. The rub, so to speak. What does Thanksgiving mean to me this cold night in late November, 2018 as I now sit in the sunroom which in many ways has become the center of my subjective reality? It means that I should be thankful for everyone and everything that has played and continues to play a part in my life too date, both bad and good, hero and villain. As I said earlier and will repeat here, I didn’t get to this moment, on the cusp of whatever comes next by myself. I had a lot of help along the way. But this last part? It falls on me. From within the silence that wraps around me like a warm, fleece blanket tonight comes a resolution. THE resolution. Six words that ring true in my mind in a hundred and one voices past, present and future. Well sh*t, folks. I may not know everything but one thing I DO KNOW is that when the universe speaks to you, you’d damn well better listen. So universe? I’m all ears. Let’s get it done. One last thing I’m thankful for. I’m thankful for the strength and the ability to be like Mike and JUST DO IT. What does Thanksgiving mean to me in 2018? It means a future, born of the past and the present, leading on into what I hope will be an exciting, and awe-inspiring finale for your old buddy El Autoro, AKA The Madchronicler. Stay tuned. I considered staring this blog entry with an Eagles chant because… well? That’s what this blog entry is about. But doing so seemed a bit formulaic, this week especially. In case you don’t know–and unless you’ve been living under a rock these past few weeks, or in some far-flung suburb of Ishcabible–the Eagles… my Philadelphia Eagles are about to play in the Super Bowl for only the third time in their long and illustrious history. Just the opportunity to witness another run at the Lombardi Trophy (all three appearances have happened in my lifetime, but only two resonate with any significance for me… I was a few months shy of five years old in 1980) is an amazing feeling. I have high hopes for them this weekend… I’ve been saying for weeks that they’re the only team in the NFL currently that can run with the evil empire, i.e. the… grumble, grumble… New England Patriots and on Sunday? I get to find out if I was right. Am I skeptical? Of course I am. I’m a Philadelphia sports fan. And if they lose… again… I’m going to be very, very distraught. But if they win? Oh my goodness if they win? Wow. Just… wow. It will be the culmination of decades of bleeding green, and routing for them with every ounce of my heart, mind and soul. But here’s a little known fact about me, and for those of you that have known me for decades, this may come as quite a shock. Believe it or not? I was not always a tried-and-true Eagles fan. My love affair with this team only goes back about 30 of my 42 years on this planet, somewhere on the right, or wrong side (depending on your perspective) of the great wormhole of existence. I came to the Eagles as a pre-teen, and first fell in love with the Kelly Green wearing collection of personalities that dominated the face of sports in this town in the time of Lee Elia and Von Hayes, Tim Kerr and Paul Holmgren. Names like Randall Cunnigham and Reggie White, Jerome Brown and to this day, my all-time favorite Bird, the legendary Keith Byars, i.e. Buddy Ryan’s medical marvel. And Buddy… oh, Buddy. You were just the guy to skipper those teams. Your personality was Philly, and Philly believed in you like they’d never believed in anyone before. Sure, you never won a playoff game but memories? Oh boy did you give us a million. Bounty Bowl and Fog Bowl? Man! Just writing it makes me smile. So how did I come to embrace the Eagles at the ripe, young age of 13? Well? It wasn’t a decision I came to on my own. I was invited into the fandom by someone that is, sadly, no longer with us this chilly night in 2018 as we prepare for the biggest football game anyone in this town has seen in 14 years (only three more sleeps until Super Bowl Sunday!). I’ve met a lot of Eagle fans over the years but this guy? This guy was and always will be the biggest member of the Bird Gang that I’ve ever encountered. A gruff and chiseled, chain cigarette smoking ex-Midshipman who was… well? Whether he was fond of me or not I don’t know. At least early on. I can only speak for myself when I say, quite transparently that I couldn’t stand him and I did everything in my power to eliminate him from my life for a long time. That changed as he got toward the end of his all-to-short stint in this world in the late 90s but I’m getting way ahead of myself. Back to the 80s. To the time of Def Leppard and Tim Burton’s “Batman,” Jams and Jellies. And, of course, Journey, a band that is, incidentally, playing in the background as I write this. One day, I was invited by this gentleman to sit down and watch an Eagles game with him and my mother. I remember that I knew football. I played it with my friends and watched the Super Bowl every year, but that was it. I can’t remember who they were playing that day though for some reason, I think it was the Redskins. It was one of the rare times I’d been invited by him to do anything so of course, I obliged. I sat down with a cup of powdered iced tea and a bowl of Snyder’s pretzels in front of me and tuned in. I remember I asked a lot of questions as the game went along. “Who’s that?” Eric Allen. “And that?” Cris Carter. I learned that the Running Back was a guy named Anthony Tony and that the Kicker was a guy named Luis Zendejas. And by the time the first half ended and the second half began, he’d basically named every starting member of the team for me, the endless flow of questions ceased and I was able to watch and enjoy… really enjoy what I was seeing. I can’t remember if they won or lost the game. I guess a bit of research would answer that question. But it wasn’t the outcome of the game that stuck with me and caused me to come back and watch again, two weeks later, and every other Sunday after that from September until December, and some years into January well into the 90s. It was, quite frankly (no pun intended), the first time he and I had ever shared something in common. Watching the Birds play on Sunday became our church and temple. Our spirituality. Whether at his house or mine, we always sat down with our powdered iced tea and Snyder’s pretzels and gorged on football. We suffered through Rich Kotite together. We shared countless mainly first, but once or twice second round, playoff bounces together and grew fond of the adage, “there’s always next year.” We never went to a game live together, likely due to the fact that by the mid-90s, he had been diagnosed with Lung Cancer, an ailment that sadly took his life in March of 1997. He never got to see Andy or Jim, Five or Weapon-X. He never got to experience four straight NFC Eastern Division Championships, culminating in the 2004 Super Bowl versus the… grumble, grumble… New England Patriots at the onset of their now over a decade long dynasty. He was gone long before, his last memories those of Ray Rhodes and an embarrassing 6-9-1 record. There are a probably a few of you reading this right now that are wondering “hey, where the f*ck has this guy been for the last year?” You’d be right to wonder. My last blog post (incidentally also a “What Thanksgiving Means to Me” ponderance) was on 11/26 of 2014. That’s an eternity for a guy that used to pride himself on writing every day. What can I say? The same thing I always say when I disappear off the literary radar for a bit: Life, man. Gul’darned, cotton-picking LIFE. It gets in the way. Between being a good Branch Manager, being a good dad, being a good husband (all things that I’m always trying to improve upon) et al et AL, writing with any sort of consistency has been a tough thing to do. The good news? Over the last two weeks, I HAVE been writing more. CHILDREN OF ENDWORLD mainly, otherwise known as #CHILDRENOFENDWORLD in my own, subjective Twitterverse (#Amwriting #Homestretch, baby). If everything goes the way I hope it to, I should be done the first draft sometime within the next few weeks, so those of you that have been waiting patiently for the continuance of William’s story? Your patience will soon pay off. And if you want to Beta read it, message me here, on Facebook or on Twitter. I’ll be lining up about a dozen once it’s fully edited and ready to go. Is it any good? That’s a tough question to answer. I’d be lying if I said I personally didn’t like it. I actually like it more than ENDWORLD. A LOT more. I’ll be honest with you: While it continues William’s story, it’s a very different story. Darker. But deeper, too. More spiritual, really. In fact, spirituality is a huge theme in it, one that I expect will carry over into Book Three, HEAVEN AND ENDWORLD (#HEAVENANDENDWORLD #Areyougettingtiredofthisyet). Okay. I’ll ease up on the Hastags moving forward. #Acceptmyapologies #STOPF*CKINGHASHTAGGINGEVERYTHING! Anywhos, I digress. Focus. Focus and we’re back on point. I’m not here tonight to write about my writing. I’m here tonight because I cannot let a year go by without a “What Thanksgiving Means to Me” blog post. It’s tradition. And LIFE cannot get in the way of traditions. The thing is? It’s been a rough year, friends. At times REALLY rough. It’s definitely had it’s high points: Disney World with my minions, my wife and my in-laws, a new Mad Max movie (still the best movie of the year, IMO; at least until the new Star Wars movie comes out next month). There’s more but my head hurts a bit too much tonight and I’m sure you don’t want to read 5000 words about every little, piddling good thing that’s happened to me this year. Back in April, I passed a Kidney Stone and it hurt like a MOTHERf*cker. See? That’s a good thing but do you really want to read about it? Survey says: HELL no. In truth? It’s been for the most part a challenging year. Sick loved ones, saying goodbye to my childhood home (booyakasha, Maple Street and J-Town: RESPECT), turning 40, turning 40 and did I mention turning 40? Yeah. That’s a tough pill to swallow. #Thisis40 and let me tell you the Judd Apatow movie was on. F*cking. POINT. The only thing it was missing was the overabundance of white hair and a sagging stomach. That said, it’s a bit tough to ruminate on the good when so much of what has happened this year has been… well? Not great. But ruminate I will because if I’ve learned one thing over my now 40+ year life on this side of the proverbial wormhole of existence it’s that it could always be worse. And at the least? There’s THAT to be thankful for. So what does Thanksgiving mean to me… hell, to ANYone in a less-than-spectacular year? Well, it remains a time to give thanks for the basics: Family, friends, good health, a roof over my head and food in my belly, a new Mad Max movie and NOW a new Star Wars movie to look forward to, a six year old minion that enjoys reading and writing as much as I do (and has her mom’s aptitude toward Math and Science, as well; it’s a powerful combination), a three year old minion with a propensity for “twirly skirts,” princess crowns and “squeezy hugs” and a wife who at 35 is just as appealing to me as she was when we started dating 14 years ago this month (11/11/01, a day that had lived and will continue to live in infamy). But it goes deeper than that, perhaps moreso when you’re coming down the #homestretch of 365 daunting days and already looking forward to embracing 2016 with open arms and a plea: Dear God please do NOT be like 2015. Pretty please? Thank you, Baby Jesus. Like CHILDREN OF ENDWORLD, there’s something spiritual about it. I can’t really describe it save for through experience. Feeling. It’s that experience… that feeling of wandering out to the curb on a chilly night after you just got done making Sauteed Apples and Cornbread (or as #NatNatBoo calls it “Corn Cake”) for Thanksgiving Dinner, lighting a cigarette, looking up at the full moon, inhaling deeply and smelling wood burning in a fireplace somewhere near. For no reason whatsoever a little smile graces your face and a little bit of serendipity wells up inside of you despite your pounding head and dire need for a good night’s sleep. As Creed sang back in the days of my wayward youth in a song that STILL has meaning for me today, “There’s a peace inside your soul/Let it be your friend/It will help you carry on/In the end/There’s a peace inside your soul.” That peace? It’s what sustains me through the tough times. But there’s more. I’ve come to realize something over the course of the last 11, soon to be 12 months. I feel it every time I see my girls after a long day at the office (and man? Some of them have been really, REALLY long; maybe not physically but mentally? Aw hell yes; a few have taken me to the brink of passing out), get a “squeezy hug” from Natalie and I hear about Cara’s mandatory Three Things she must reveal to Nicole and I every night that she did at school that day (which usually revolve around a subject–Math for instance–recess and either Spanish, Music, Art, Library or Computers depending on the day). That feeling? The aforementioned “more?” Simple, friends. Love with a capital “L.” It wells up inside of me to the point where I can barely suppress it and focus on driving, or making dinner, or giving Natalie a bath and spotting Cara while she showers. I look at their Cherubic little faces–still so much like Nicole’s and for that I remain grateful–and listen to them speak, or sing, or even bicker. And I smile. Maybe even shed a little tear (though I’m quick to disguise it from their view; they hate it when I cry). And I think to myself: Thank God for them. For my wife. For my friends who I can still talk to about any and everything from the most mundane–Rousey losing to Holm for instance–to the most complex–discussion of the respective books we’re working on. For my family who I can still call if I need advice. And with that? I’m spent. #Itsgettinglate #IvealreadyneglectedNicolefortoolongtonight. But I’m glad I did this. And I’m glad that if you’re reading this right now, you once again came along for the ride. I appreciate you in ways you can’t possibly imagine. Your support. Your candid feedback both good AND bad. I oft times end these little ponderances with a long list of arbitrary thank you’s but tonight? I’m not going to do that. #Keepingitreal. I’ll just end it with one. Thank YOU, friends, readers and fellow sh*theads. And have a Happy Thanksgiving. Good Evening, Morning or Afternoon my fellow inhabitants of this side of the proverbial wormhole of existence. Did you miss me? Probably not. Regardless of whether you did or did not the bottom line is this: I’m back. Things have been a bit hectic these last few weeks and admittedly? Writing–whether it be something simple like a blog entry or something complex like CHILDREN OF ENDWORLD–has been the furthest thing from my mind. But if history has taught me anything, it has taught me that you can only stop something that you love doing for so long. There comes a point where you just have to, for lack of a better phrase, hop back on the horse named “Tucker” (thank you, Cara) and GO. Whether this “quick hit” exemplifies me getting back on the horse or not remains to be seen but for now? It’s a beginning. And lately? I’ve been focusing too much on endings. Let me take a “tick” and bring you up to speed: A bit over three weeks ago, I was laid off and have been unemployed since. I have not publicized this for a couple of reasons. The first? I’m not a fan of feeling sorry for myself nor of asking people to feel sorry for me. Said lay off was purely a business decision and I bear my former employer no ill will. I’ve been managing “stuff” for almost 20 years now and when times get tough–as they are now and have been for a while–you need to make cuts. I was the highest paid person with the lowest tenure in my office. It had to happen. I enjoyed my eight plus years with that company and admittedly? There is a little hole in my heart where once existed the letters “AFS.” I miss my customers and many of my co-workers. If any of them are reading this right now let me simply say this: Booyakasha. RESPECT. Thank you, all. I will never forget you. Hit me up sometime. My digits are REMOVED FROM THIS POST FOR FEAR OF THEM BEING ABUSED BY LESS SCRUPULOUS TYPES OR CARNIES. Sh*t, Carnies freak me out. The second? Everyone’s got problems, and mine are no larger than theirs… yours if you’re reading this. My situation is really not that bad. If anything, these last couple of weeks have given me the opportunity to really think at length about what I want to do with the rest of my life on this side of the proverbial wormhole of existence, however long the almighty has deemed that life to be thanks largely in part to a wife who has been endlessly supportive of my plight. Booyakasha, Nicole, AKA Sweetie: Respect. And much love, dawg (winky emoticon, smiley face). I’ve been able to spend a lot more time with her and my little’uns and it’s been wonderful. I’ve managed to “knock out” a number of projects that I’ve been meaning on “knocking out” for, in some cases, years, and though I still haven’t cleaned out my garage or repainted my garish, yellow bathroom, there still may be time. Though something tells me that my days on the unemployment line may soon be coming to a close. My goal when this happened was to find something by Thanksgiving and as of this moment? I may have. I’ll hopefully know more in the next few days. That said, I likely just jinxed myself. F*ck. I’ve only myself to blame, really. And Carnies. And the Rogue. Always blame the Rogue (Booyakasha, Tommy: RESPECT). I knew early on that the key for me (this may not be the case for others reading this and if it is not I apologize in advance) was to find something that both A.) Played to my strengths and that B.) I felt comfortable doing. Early on, I mainly looked at jobs with a heavy sales component ’cause outside of writing–which I think I’m pretty good at though others, namely the Troll that bashed my novel on Amazon, don’t–I’m a pretty good salesman. I’ve been doing it for a while, now. I should be. If I wasn’t, someone would have told me long before now. And it runs in my family: Both my mother and my Biological worked in sales for the longest time… woah, woah, woah: For the longest time. I’m a better writer but as much as I want there to be one, there isn’t a career in that for me. Yet. Maybe one day but as of right now? It’s little more than a hobby/a part time, supplemental income. But I’m still hopeful. CHILDREN = 75% done despite a bit of a pregnant pause in the process. And it’s good, guys. Better than the first one. Cross my heart. Still coming in 2014. Stay tuned. As time progressed, though, and I went through a couple dozen job postings and a few interviews I realized something pretty important: I don’t want to be JUST a salesman. Willy Loman I ain’t (poor usage of the English language completely intended). I want… I NEED a people component, as well. Whether said component is a managerial one or simply a B2B/B2C (that’s “Business to Business” and “Business to Consumer” for the un-initiated or gainfully employed) one I need to work with people. I like people and for the most part, I think people like me. So I started branching out: Looking at admissions and recruitment positions, as well. And low and behold, I MAY have keyed on one though only time, namely the next few days will tell. We shall see. I’m optimistic. Hopefully they are, too. And hopefully the Carnies stay the hell away. SHIVER. In short? I decided what I wanted to do with the rest of my life. At 38. How f’*cked up is that? Most people go through this in their 20’s. Me? I was on a career path throughout them albeit a slightly suicidal career path with CVSStress that likely would have ended with me either A.) In the grave or B.) Running a District by now. I walked away from that job of my own volition because I was about to get married and I didn’t think working 65-70 hours a week was conducive to starting a life and a family with someone. I found AFS and for eight plus years, AFS allowed me to build a life and a family, embrace my inner Willy Loman and publish a novel. But… and here’s where one or two (or a dozen) of you might disagree with me: I believe in the “D” word. No, not “doo-doo” though Smallish Bear WAS kind enough to bless me with a bit of a Poop-pocalypse pre-her bedtime tonight. Booyakasha, Natalie: RESPECT. Destiny, guys. Fate. I believe that we all have one. Whether you feel the same or believe that our lives are not pre-determined but are 100% a product of the decisions that we make is up to you. Me, personally? I think the almighty, otherwise known as God, “The Big Guy” et al has a set-ending for each of us. How we get there is up to us, i.e. “Free Will.” It’s like writing a novel. You generally know how the story begins and you know how it ends but how you get there is constantly in flux. Adaptability is KEY. THE key, really, to life, the universe and everything. Me? I’ve always been adaptable. It’s something deep down within me in a place that I don’t like to talk about at parties (but obviously have no problem writing about for the entire gul’darned world to see). I adapted to Retail despite my wanting to be a writer, and I adapted to Engineering despite my wanting to be a writer/my familiarity with Retail. Now? I am ready to once again adapt to something new. A new field, if you will, and… fingers crossed… I WILL HAVE that opportunity. I certainly hope it’s my last one ’cause really: I’m 38 years old. I’m far from “old” though I’m not exactly a little’un, anymore. Whatever I do from now until the proverbial lights go down on me? I want it to be IT. The last thing I do outside of writing and publishing which, let’s face it, I will ALWAYS be doing. Live. ‘Cause oft times, life gets in the way of that. Carnies, too. And the Rogue. That gul’darned, troublesome Rogue. To be continued, friends. G’night. I had intended on finishing up Part Three of Children of Endworld today but found myself unable to do so. Not for lack of desire: That’s there. But my eyes, and the eyes of many have been glued to developments in the naval yard shooting that happened in DC this AM. If you are unaware of what I am “talking” about please open another window in your web browser and redirect it to either CNN, Fox News or whatever outlet you generally follow. You’ll quickly see what I’m referring to. You can come back to this later. Priorities, priorities. Are you back? Cool. Welcome. As is often the case when something like this happens, I keep one eye on the news and one eye on my social media feed since I am always curious to see what other people are thinking about it. In the process of checking the latter I came across a curious Facebook status post in which a friend of mine questioned the existence of God, “a god” or the gods in light of not only this horrific occurrence, but others (i.e. the boardwalk fire in Seaside Heights this past week, the historic flooding transpiring in Colorado. the Aurora movie theater shooting last year and the Sandy Hook tragedy last winter). I’m not going to quote him/her ’cause… well, I didn’t exactly get their permission and I don’t want to incur their wrath but he/she brings up an interesting point: When a rash of sh*t “goes down” like it has in the recent past here on this side of the proverbial wormhole of existence, what are you supposed to think? Faith can only get you so far. Most people want to see proof: Proof that there is, in fact, a benevolent force that watches over us and guides us through our daily travails. When “stuff” like what I mentioned in the previous paragraph happens, though? It’s hard. Damn hard. I know: I’ve been there and who knows? I may end up there, again though quite frankly (no pun intended), I don’t quite want to. The above veiled message brought to you by my subconscious. Frank Marsh’s subconscious, sending cryptic messages to people for over 20 years. Where’s the proof? Twelve dead, one shooter DOA and one more potentially at large in DC, currently. Dozens of schools around the naval yard on lock down; hundred of thousands of people, both employees and neighbors alike scared sh*tless. Dear God: Where the f*ck are you, right now? Is it true what Al Pacino said in “The Devil’s Advocate”–that you’re an “absentee landlord”–or what Piers Anthony described in his Incarnations of Immortality series–God, nothing more than a bored smiley face looking down from above upon the world and not doing anything while his arch nemesis the Devil wreaks havoc? I don’t know, guys. I honestly don’t. I have about as much proof of God’s existence as you do. But I was raised to believe in His/Her/It’s existence and I cling to that, even now when my entire subjective universe seems to be “flaming out.” It’s not just DC, Seaside, Colorado (times two) or Sandy Hook. It’s North Korea. It’s Syria. It’s Cold War Deuce between the good old U S of A and Russia. I cannot think of a time in my 38 plus years of existence when the world has been this completely and totally f’d up and admittedly? The claim that “the end times are nigh” is starting to feel slightly more relevant than it did a few days, weeks, months and years ago. Maybe that’s the case. Maybe the sub-segment of the population I once called “The Bible Thumping Junkies” are right, though I deign to start interpreting the context of the Book of Revelation as proof that we’re all about to get rapture’d something fierce, even in light of my background over-evaluating everything from Will Shakespeare’s sexual preference to the now-defunct TV series “LOST.” Whenever it happens, it happens. If that’s tomorrow then so be it: I intend to be standing at ground zero, just like I always said I would with my minions on one side of me and my wife on the other. ‘Cause really, who wants to live in the post-apocalypse? Not I and, I hope, not my wife and my minions. If I’m going to be forced by God, “a god” or the gods to “shrug off my mortal coil” then gul’darnit, I want to do so with my loved ones beside me. The afterlife just wouldn’t be the same without Cara’s singing and dancing, Natalie’s laughing and Nicole’s… well, that’s between her and me. Sorry to disappoint. The above veiled message brought to you by my libido. Frank Marsh’s libido, scaring the f*ck out of the women in his life for over 20 years now. No. I’m not going to hop on the end of the world bandwagon. Nor am I going to act like nothing is wrong. I can understand my friend’s statement that in times such as these, he/she doubts the existence of “something.” Not necessarily God, “a god” or the gods but “something.” I like that word: Something. ‘Cause you can explain virtually everything that happens on this side of the proverbial wormhole of existence with science–from evolution to life, to death and the universe–but in my experience? There’s really no way to describe how it all or what I like to call “The All” began. Even if you believe that the universe on this, and every side of every wormhole in existence has always existed in some way, shape or form there has to have been a beginning. Or perhaps that’s me trying to impose order on chaos. But it’s what I believe. And that’s really what this all comes down to, guys: Belief. Whether you agree with me or not is irrelevant. If you choose to debate what I’m saying please do so in the “comments” section and I will do my best to respond. So what do I believe? Simple: I believe that once upon a time, something existed, and said something was a very young, very curious, very lonely something. He/She/It had a knack for creativity… imagination. One day, He/She/It took two possibilities and synthesized them into what He/She/It hoped would be fact. Whammo: The beginning. But little did He/She/It know that what He/She/It had created was at it’s core uncontrollable. So He/She/It did the best that He/She/It could, kind of like me and you and you (yeah, you; don’t look so surprised) trying to control our oft times uncontrollable lives. It made mistakes along the way like we do… it still makes them to this day like we do; He/She/It can’t get everything right which is how we end up with a shooting in DC, a fire in a shore resort north of AC, a flood and another shooting out west and a shooting up north, not to mention a dictator in the Far East that likes basketball and another one in the Middle East that is sitting on a cache of chemical weapons. Did I mention Cold War Deuce? Brought to you by “Hot Shots Part Deux.” Why? ‘Cause I can. And ’cause Charlie Sheen is always winning. That something? He/She/It is still learning and likely will continue learning long after me, my minions, my wife, all my loved ones and all of you reading this are long gone. Maybe one day He/She/It’ll “figure it out” and what was once eminently changeable will become consistent. But I see no indication that that day is coming any time soon. And maybe by the time it does those two, initial possibilities that He/She/It synthesized into fact will “fizzle” out like some chemical reactions do and the whole shebang will come crashing down. Then? Well, depending on where something is at that point He/She/It will either chose to start over from scratch, or concede defeat and go back to twiddling His/Her/It’s proverbial thumbs in the vast, silent nothingness. Admittedly? There are days where I wish I could do that. Is it wrong of me to believe that on days like today, when the universe on this side of the proverbial wormhole of existence appears ready to explode from one too many “possibilities synthesized into fact,” He/She/It does, as well? The above blog post was brought to you by something. Something: Giving Frank Marsh a topic to “talk” about for 38 plus years. Winky emoticon. Smiley face. And say a prayer for the victims of the DC naval yard shooting, guys. If you don’t pray, spare them a thought. Please. Thank you. Earlier today (yesterday, actually), I sketched out a swooping blog entry on turning the big 3-8, otherwise known in my subjective reality as the big 4-0 minus two. As of 12:33 AM on my birthday, August 20th, 2013 I have decided to scrap it. ‘Cause really, what more do I need to say about getting older that I haven’t already said a dozen times before in a dozen different ways? I have a bit more gray in my hair and my beard… okay, I have a LOT more of both as well as this one, pesky gray chest hair that keeps coming back no matter how many times I pull it. I have a few more aches and pains than I did at this time last year. Yadda, yadda, yadda… I’m sure you get the picture. But do you know what, guys? Everyone gets older. It’s a natural fact of life. It starts from the day we’re born and it progresses onward and upward until the day, hopefully decades hence when we leave this life for whatever comes next. I’m no different than any of you reading this, right now. I’ve accomplished a lot in my now 38 year existence on this side of the proverbial wormhole of existence. I’m married with two beautiful daughters; I’m a published author, albeit a self-published one; I have a steady job and a loving circle of extended family and friends that I would not trade for, to employ one of William MacNuff’s old cliches, “all the tea in China” (despite the fact that William has no idea what or where China is). For the most part, I’ve spent the last decade plus as a living and breathing facsimile of a smiley face and save for one or two vices–smoking, and the occasional drink to name two–and a few minor health issues I’m in pretty good shape. So why lament getting older? Did I think I was going to be 25 for the rest of my life? Survey says: H-e-double hockey sticks no. So I’m not going to write some long and meandering preponderance on aging. In truth, I’m not really struggling that much with the age-thing, presently. Instead, I am officially going to go “against the grain” and declare today a day of affirmation for me, a pseudo-madman, residing on one side of the proverbial wormhole of existence. Why? I’m glad you asked. About an hour ago (it’s now 1:26 AM). I stepped outside onto my stoop to have my customary first birthday cigarette. It’s a practice that I’ve adhered to for many, many years: I sit on my stoop, I smoke, and I think. I ponder where I’ve been and where I’m going. I hadn’t intended tonight to be any different than years past but guess what? No sooner had I stepped outside into the cool, yet humid night air than I realized the moon was either Full, or a day or two away from it. So I broke out my trusty smartphone and guess what? August 20th, 2013 is the day of August’s Full Moon. But it’s not just any Full Moon. It’s a Blue Moon, i.e. the third Full Moon in a season with four total (most seasons only have three). I know that that is not the popular definition of a “Blue Moon.” The popular definition of it is the second Full Moon in a single calendar month but… and I’m sorry to burst your bubble, amateur star gazers… that’s not an entirely accurate definition. The first is the actual, traditional definition (CITATION). So August 20th, 2013 is a traditional, Blue Moon. A rare occurrence that spiritually (correct me if I’m wrong) signifies a purging, i.e. emotional, physical et al. So I got to thinking: What better time to purge myself of my age-old preconceptions about aging and my birthday? Why not embrace it rather than rage against it? Survey says: Why the f*ck not? So I decided. I came inside, sat down, fired up my lap top and started typing. Which brings me to “right here, right now,” and there truly is no other place that I’d rather be. Shortly, I’ll finish this little “quick hit,” head upstairs and go to sleep. And when I wake up? I’ll be spending my birthday with my girls. I already got to share midnight with my wife, Nicole. She gave me my first birthday gift: An interchangeable Sonic Screwdriver with 80 different, potential combinations to “customize my Doctor Who experience.” While some of you reading this may not appreciate that as much as others understand that it is, hands down, one of the coolest birthday gifts I’ve ever gotten and I am incredibly thankful to Nicole for getting it for me. Booyakasha, sweetie. RESPECT. I love you. Later today, we are making an early sojourn to the zoo with our minions (pre-things heating up here in southeastern Pennsylvania) to check out the new kid’s center there. Thereafter? Well, I’m not really sure what the rest of the day is going to hold but I’m open to any and every possibility. I’m going to cherish every second… every minute, and every hour because I can. I should. Because birthdays are supposed to be fun, right? Somewhere along the way, I forgot that. Early onset dementia? Maybe. Then again, maybe not. Disillusionment seems a more likely possibility. I’ve disillusioned myself into thinking that my birthday is a bad thing, i.e. it’s just another day, another number and another step closer to the big 4-0, the big 5-0 and onward and upward until the “D” word arrives. No longer, though. Today, I am the big 3-8, otherwise known as the big 4-0 minus two. And I’m okay with that. I’m okay with the extra gray in my hair and my beard and that lone gray chest hair that just won’t. Go. AWAY no matter how many times I “prick” it. I’m okay with a few minor aches and pains. Because I’m not 25 anymore. I haven’t been for over a decade. I’m 38: Older, wiser and happier than I was back then. I remain a living and breathing facsimile of a smiley face and come what may? I will always be that. Winky emoticon. Smiley face. G’night, all. Pleasant dreams. Okay so admittedly? 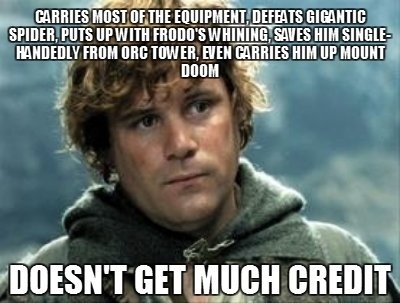 I would have preferred a non-Sean Astin portrait of Samwise “Sam” Gamgee but unfortunately, the only JPEGs of Sam on the internet are either pictures or memes like this one from The Lord of the Rings movies. But this one kinda’ resonates with the theme of this little blog entry. I’d wager that most everyone has either read the books or seen Peter Jackson’s masterful movie trilogy at some point in the last decade plus. If you haven’t? Seriously, people. PRIORITIES. I’m not saying they’re Star Wars good but next to Star Wars it’s arguably the greatest trilogy in movie history (NOTE: I do not include Indiana Jones because of the travesty that was “Crystal Skulls”–even though it was the fourth movie and is not, technically a part of the “trilogy”–Back to the Future because of “Part Two” and The Godfather because of “Part Three” and Sofia Coppola). Read ’em, or see ’em at some point before you die and parents: Get your children to read them AND The Hobbit before they’re too old to appreciate them. You can avoid The Silmarillion if you’d like. There are days I wish I had. Everyone has a favorite character or characters in the Lord of the Rings books or movies. My wife, Nicole? She loves Strider/Aragorn (not Viggo Mortensen, mind you, but the character he plays). My friend Caren (booyakasha, Caren: RESPECT)? She loves Gollum. There may even be one or two people out there reading this that like Frodo though I’ve got to tell you, I was never a big Frodo Baggins fan. Sure, he’s the ring bearer for 90% of the books/movies and that has to count for something but really? Save for the whole holding-the-evil-at-bay thing long enough for him to dispose of the One Ring in the fires of Mount Doom what does he really do? For sh*t’s sake, he technically doesn’t even keep the evil at bay long enough to dispose of the ring. Were it not for Gollum’s interference, he likely would have stayed invisible, walked past Sam, out of the cave, back down the slopes of Mount Doom, out of Mordor and into a dark hole somewhere to live out his years. Sauron would have won, The Shire would have started looking like a post-Industrial ruin ala Detroit and… well. I’m guessing you get my point. Why? Because everyone, at some point in their life needs a Samwise Gamgee. When the going gets to be it’s toughest, everyone needs someone that is willing to pick them up in their weakness, throw them over their shoulder and carry them. We can’t do it on our own. No one is THAT strong. I’ve encountered many people over the course of my almost 38 year existence on this side of the proverbial wormhole of existence that claim to be that strong but I have never met anyone… EVER… that didn’t need to be carried every so often. Whether carried by someone else or carried by God like in the poem “Footprints” (also a personal “fave,” and I’m not an overly religious person), I consider myself a very strong soul. But there are times in MY life where I’ve needed to rely on my own, personal Samwise Gamgee to cook me a “brace of conies,” or talk me down from doing something stupid like handing the One Ring over to the Nazgul. And oft times I, too, have put a proverbial sword point to that noble person’s neck because I didn’t WANT to keep going. I wanted to give up. Those people? Top to bottom, from my wife to my mother and my sister to my co-workers to my friends of a couple of months to my friends of a couple of decades… to all of them, I owe an eternal debt of gratitude. As Ed Wilkinson says in ENDWORLD – A Novel, “Wus.” I have no idea what it means. I Googled it and came up with “a derivative of the terms ‘wuss’ and ‘p*ssy'” but my OWN friend, Ed, used to say that too me all the time. I think it’s an Eastern term of endearment. If he’s reading this, maybe he can chime in. And Ed? if you ARE reading this and you really WERE calling me a cross between a wuss and a p*ssy, f-you, buddy. And “wus” right back at you. But even that is not enough, sometimes. Sometimes, something more is required and that something? My own, personal Samwise Gamgee? That which this blog entry would be dedicated to if it had a dedication page? I’ll give you three guesses and the first two don’t count. Give up? You make me sad. WRITING, ladies and gents. WRITING. When things start to go cuckoo, I always turn to writing. There have been times when I’ve told myself that I wouldn’t: That I’d put it on hold until such time as I… for lack of a better phrase “sort my sh*t out.” But that’s about as realistic as the idea of Gandalf and the Balrog falling through Middle Earth and popping out on the other side to do battle, Gandalf with his sword and staff and the Balrog with his fire… sword, whip, WHATEVER (I’m sure it could morph into a spoon if Bal-lee Baby wanted it to; the perks of being an “ancient evil”). Last week, I wrote that I was at a crossroads with Children of Endworld. A dark place that I really don’t want to go. But I’ve determined something in the last few days, ladies and gents. I’ve determined that I NEED to keep going for a couple of reasons. First and foremost because people are counting on me to finish it in a reasonable amount of time and not 19 years from now when I’m almost as old as Gandalf (okay, maybe not THAT old; he’s, like, thousands of years old, and I’m a pup by comparison). Those people? The ones that enjoyed ENDWORLD – A Novel and want to read more? Well, I guess I just don’t want to let you down. So either tonight or tomorrow, I’m going to resume what I started and see what happens. Amy Veitz (my editor) be forewarned: Parts One and Two are going to be popping up in your email within a few moments of when I complete this. By virtue of being the person who volunteered to reign in my oft times “tough language” a couple of years ago you get first dibs on William’s continuance. I look forward to hearing back from you. Booyakasha: RESPECT. Winky emoticon. Smiley face. The second reason? Because writing has always been, for me, my most important Samwise Gamgee. That in no way, shape or form discounts any others from my beloved wife, Nicole, to my friend and brother Matt who once upon a time took me out to Denny’s every night to help me put my life into perspective, and lately has been doing the same. Not Denny’s. We’re too old for a Grand Slam breakfast, nowadays (clogged arteries and all that). Booyakasha to YOU sir. Once again: RESPECT. But writing? Writing has been the lone constant for me for as long as I can remember. It has carried most of my equipment (or, if you’d prefer, “baggage”). It has never defeated a gigantic spider but it HAS helped me get passed my nightmares. It ALWAYS puts up with my whining (and by God, I do a LOT of whining, you just don’t “hear” it on here). It never saved me single-handedly from an Orc tower but it DID rescue me from a lot. From the loss of my adopted father many moons ago to the saga that was me, and the Feminine Bane of My Early Existence back when we all lived in “Oz” and no one lived anyplace else. It has oft times carried me up the slopes of Mount Doom. Do I give it enough credit? Probably. Does it deserve more? Again, probably. I owe it to my own, personal Samwise Gamgee to… as Sean Astin historically ad-libbed during the shooting of “Return of the King,” “be rid of it once and for all! Admit it, guys: You teared up. I still do, every time I see it.